Your "casa particular" of choice in Baracoa, Cuba. Villa Paradiso is your “casa particular” of choice in Baracoa, Cuba. Similar to a guesthouse or bed and breakfast, “casas particulares” are family homes that rent out bedrooms to travellers looking for a private homestay, closer to the authentic country, in the middle of its neighbourhoods and people. Villa Paradiso sits on a little hill caressed by the sea breeze and with a beautiful view over Miel bay, where the Miel river meets the sea. Our casa particular is only six blocks from Baracoa’s vibrant downtown yet on the hill there is a relaxed, almost countryside feel. At Villa Paradiso you can spend a few days or even a season in a welcoming and uniquely located house, fully immersed in one of Cuba’s most scenic, green and pristine regions. Hello! We’re Manuel & Roberto. We’ll be delighted to host you at Villa Paradiso. Manuel is a former professor at Universidad de Oriente’s Agricultural Sciences Department, in Santiago de Cuba, where he was responsible for education quality evaluation. His life partner Roberto works in the field of social justice and divides his time between Canada and Cuba. It will be our pleasure to offer you information about the region and suggestions or recommendations so you can make the most of your stay, whether you like Cuban cultural life, lush natural parks, unblemished beaches, crystal clear rivers, hiking in tropical forests, ecotourism, cyclotourism – or a mix of it all! We also offer breakfast and dinner upon request – traditional and creative Baracoan & Eastern Cuban cuisine, with options for everyone, including those who eat meat/seafood and those who are vegetarian or vegan. Just tell us what you’d like! 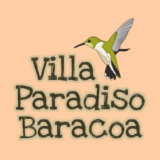 At Villa Paradiso we strive to offer you a stay in Baracoa that’s informed by sustainable tourism. Our family and home welcome LGBTQI (lesbian, gay, bisexual, trans, queer, intersex) travellers. Manuel speaks Spanish and a bit of English. Roberto speaks Spanish, English et lorsqu’il est à Baracoa, vous pouvez être accueillis en français. Please note: we have a small Havanese dog, a cat and a parrot. Baracoa 2018 in Review – Best Pictures, Shout-Outs and More! &COPY; 2015 Villa Paradiso Baracoa. All rights reserved. Developed by RONINSOFT.